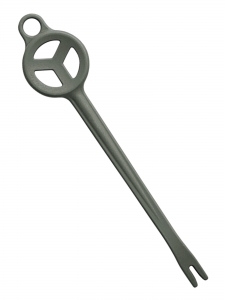 A hook remover unhooked with ease by just pressing the hook remover after hooking the Y-shaped head. The grip with three-piece dimples can be held stably and firmly. 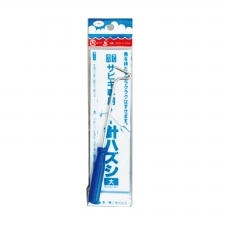 Unhooked with ease by just pressing the hook remover after hooking the Y-shaped head. A short style with a total length of 105 mm and three-hole dimples makes it easy to hold strongly with your fingertips and secure the leader line firmly. Provided with a handy handle. Easy of fish removal without touching the fish. 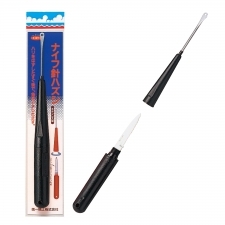 The handle incorporates a knife for ease of ikejime (living fish fainting) after fish removal. Incorporating a stainless steel wave knife. Simply hook the main line and leader line onto the V-shape indentation and pull the lines. 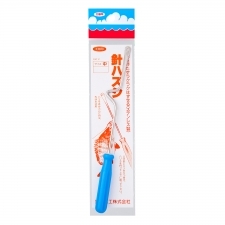 Possible to remove small fish, such as horse mackerel, quickly and easily without touching the fish by hand. Possible to grab the removed fish with the Automatic Hook Remover without touching the fish, which keeps your hands clean. 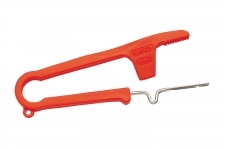 Ideal for handling small horse mackerel and chub mackerel.